Seeing shoes or other items that I wore as a baby is always interesting in a detached sort of way. What’s crazy is when something survives that I have real memories of wearing. I still have my cub-scout uniform for example. It’s hilariously small but I can remember getting it out of the closet and putting it on. It’s strange to hold tactile evidence from when I was just a kid. do those shoes have suction cups AND rockets!? Heck, I’ve still got a model airplane that I built 25-or-so years ago. Compared to my more recent work it’s quite primitive, but I’m still rather proud of it. No wonder Biff turned out the way he did. We can now officially blame his parents! Can you imagine bronzing your shoes? I suppose that is to prevent moths…. Better than mothballs at it even. Man, finding my old Girl Scout vest in the closet was weird. It was really small. It’s in Biff’s genes… It isn’t just the shoes, but the mindset that created the shoes. His parents were Biff-tastic before Biff ever was. That’s a record for slowest ever! It has a strange reason though 😛 I love you’re comic and have taken all the time to read them all very carefully. Hope to see way more of Biff and his painfull powertools, inventions, bodyparts etc. I wore baggy clothes as a little kid (mostly due to hand-me-downs), and my mom’s a pack-rat. So when she decided to finally go through all the boxes of old clothes, I received a bunch of awesome t-shirts from my childhood that still fit, including a legendary wolf shirt! Do they have “ACME” stamped somewhere on them? Have to admit finding a T-Shirt from when i was in first grade. It was one of those that had all the names of the teachers and students on it. Looking at it just weirds me out since it’s so TINY. One of the few things that survived since my childhood is a small gold medal that I won in a swimming meet when I was in elementary school. My parents were so proud that they had it bronzed. finn went to his first cub scout meeting last night. he is so pumped. I still have this shirt from when I was in PreK-4. Gosh, it’s hard to believe I was even that small at one point. But on Biff, I wonder which parent bought him those shoes, let alone decided to bronze them: His mom or his dad? I wonder if they were bronzed before they put them on him. You know, to save on the wear and tear. Strangely, I have no clothes, but I’m clinging to a bracelet I found in a pet shop when I was 6. Someone had dropped it on the floor and…well, y’know, finder’s keepers. Still manages to fit around my wrist too. Biff must have had a very exciting childhood. I just had a horrible thought… Maybe those aren’t Biff’s shoes… Maybe there’s a Biff, Jr. running around out there somewhere! Ooooh. It’s “old crap you find in your basement” week! @MaskedMan: It could’ve been worse. You could have said “mammory lane”. I never remember anything from my younger years unless I sit, and think, and think. Its just hard to remember. Why is everyone questioning the bronzing of the shoes? It’s a tradition in Biffworld. Oh, wait…. you don’t live here, do you? 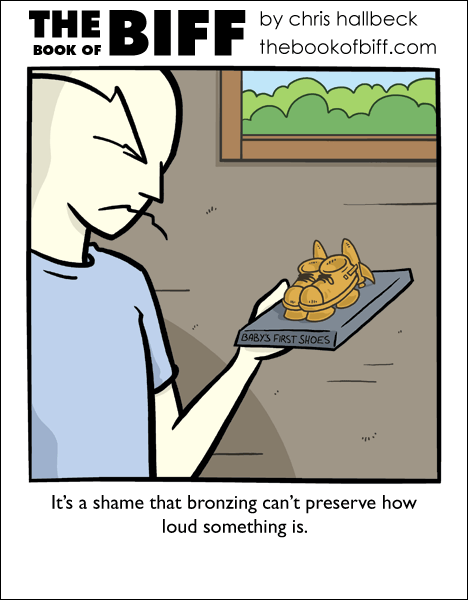 Anyway, bronzing things is a way of showing how valuble they are. Apparently, every year, a kitchen utensil is named, and it is called lucky to stick said appliance of the year down your pants. According to the book, they started to stop believing this during the year of the electric can opener.